Death of Arthur, Prince of Wales, first son of Henry VII and Elizabeth of York (daughter of Edward IV and Elizabeth Woodville) at Ludlow Castle, Shropshire, buried in Worcester Cathedral. Death of Eleanor of Aquitaine. She was first married to Louis VII of France, from 1137 until their divorce in spring 1352. She married Henry II of England in May 1352. At the time of her death she was 82. She was buried at the abbey church in Fontevrault, next to her second husband. Several of their children, including their son Richard I ‘the Lionheart’ are also buried there. Photograph of the tomb effigies of Eleanor of Aquitaine and Henry II at Fontevrault Abbey taken by ElanorGamgee; obtained through Wikimedia Commons. The Battle of Towton , regarded as “the largest and bloodiest battle ever fought on English soil”, was fought in a snow storm on Palm Sunday, 29 March 1461, between the Lancastrian forces of King Henry VI and the Yorkist forces led by Edward, Earl of March. It has been said that 28,000 men died that day, out of 50,000 to 100,000 soldiers. The result was a Yorkist victory and Edward became king as Edward IV. In 1996 a mass grave of fallen soldiers was found at Towton Hall. Their remains have been studied by the University of Bradford. Edward IV had planned to build a memorial chapel at Towton, but it was Richard III, who put this plan into action. The chapel was nearly finished, when he was killed at Bosworth, and the chapel had been lost. Or so it was thought. In October 2013 it was revealed that scientists had found strong evidence of remains of the chapel. In 2010 fragments of hand held guns and lead shot were found at the battle site, the earliest ever to be found. A short description of the various battles of the Wars of the Roses can be found on the website of the Richard III Society. On 28 March 1461, a skirmish at Ferrybridge, West Yorkshire, was fought in the lead-up to the Battle of Towton. Richard Neville, Earl of Warwick (‘The Kingmaker”), received an arrow wound to the leg. John, Lord Clifford, (believed to be responsible for the death of Edward IV’s brother Edmund, Earl of Rutland) fell on the Lancastrian side. Traditionally the skirmishes at Ferrybridge and Dintingdale (also on 28 March 1461) and the battle of Towton were seen as three separate battles, both in space and time. However, Tim Sutherland argues, that these were rather three interconnected conflicts. He bases his analysis on archaeological finds and a new interpretation of the sources. Death of Mary of Burgundy, stepdaughter of Margaret of York (sister of Edward IV and Richard III). More information on Mary here. King Richard III’s remains were reinterred in Leicester Cathedral in a dignified and moving service on 26 March 2015. The service was conducted in the presence of the Most Revd Justin Welby, Archbishop of Canterbury. The order of the service was designed in cooperation with Dr Alexandra Buckle. Dr Buckle had found a manuscript, which contains details of a medieval service for the reburial of the human remains of a noble person. She was researching Richard Beauchamp, Earl of Warwick, who was reburied in Richard’s presence in 1475. This document served as a basis for Richard III’s reinterment service. During the service, Richard was also reunited with his Book of Hours, about which I had written on another site, though before Richard’s reinterment. 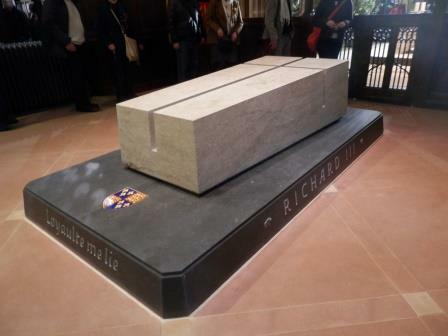 On the following day, 27 March, Richard III’s tomb was revealed during a service. Together with several friends, I had in the opportunity on that Friday afternoon, to see the tomb in all its glory. 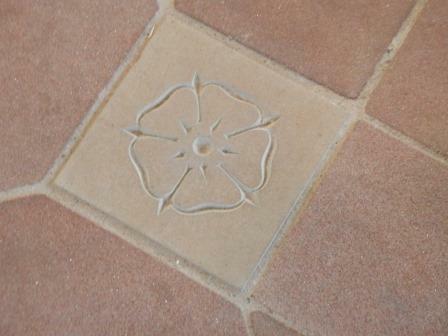 For me, the floor tiles with inlaid Yorkist roses were a nice touch. Together with many, many other Ricardians, I was able to spend the Reinterment Week in Leicester, a profound and exhilarating experience. The week started for me by watching the cortege passing at Jubilee Square. 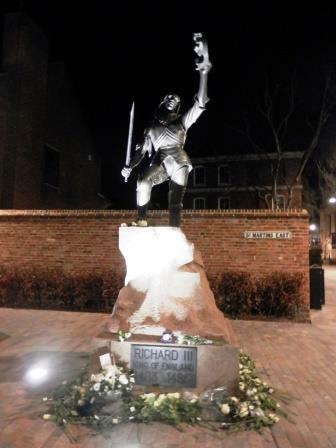 On Monday, 23 March, Memorial Service for members of the Richard III Society was held in Leicester Cathedral. I had been lucky in the ballot and received an invitation to this beautiful service. From where I was seated my view of the proceedings was obscured, but I had a clear view of the reason for the service, the coffin of Richard III. It was covered with a beautifully embroidered pall, on the one side displaying figures from the 15th century and on the other side figures involved in the 21st-century discovery of the King’s remains. The Choir sang In Memoriam: Ricardus Rex by Graham Keitch. Many of us remember this from the 2013 Australasian Convention in Sydney, where we were able to play it by permission of the composer. There can be no doubt though that to listen to it in a church sung by an outstanding choir beats a recording played over a loudspeaker system. We all would have liked to attend the actual reinterment service in the Cathedral, but space did not allow that. However, along with several of our branch members from NSW, I was able to watch the service on TV live at our hotel in Leicester. The most memorable part for me was a natural phenomenon: It was an overcast grey and drizzly morning, but at the exact moment, when Richard’s coffin was lowered into the ground, the sun broke through. His troubled afterlife had finally come to rest. It should also be mentioned that the NSW Branch of the Richard III Society made a donation to Leicester Cathedral to help cover the costs of the reinterment. This was received by Revd Peter Hobson with thanks to all members of the NSW Branch in the name of Leicester Cathedral. Publication of William Caxton’s translation of Aesop’s Fables, printed at his workshop at Westminster. ‘Love Day’ at St Paul’s. An attempt at reconciliation between the opposing Yorkists and Lancastrians, loyal to Henry VI, to resolve the feud resulting from the 1st Battle of St Albans (22 May 1455). Then, on Lady Day (25 March), the King led a “love day” procession to St. Paul’s Cathedral, with Lancastrian and Yorkist nobles following him, hand in hand, among them Richard, Duke of York, with Queen Margaret of Anjou. Birth of Margaret of Anjou, daughter of Rene, Duke of Lorraine and Anjou, and niece of King Charles VII of France, at Pont-à-Mousson, Lorraine. Married to Henry VI of England.